We’ve redefined mom jeans, shared inspiring stories and encouraged moms to splurge a little on themselves. In the last of our series for Mother’s Day this year, we’re talking about maternity fashion. What can you expect when you’re expecting? To look good, that’s what! Of course, it’s not just about how to find amazing maternity clothes, but also about selling the styles that you don’t plan to wear again. Not sure where to get started? We’ve got you covered! Utilize search and filters. Some of your favorite brands have maternity lines, like ASOS, H&M and GAP. To find these, head to the search bar and search “maternity.” Then filter by brands and categories. Don’t forget to head to the brands page to find popular maternity brands like A Pea in the Pod, Motherhood Maternity, Ripe Maternity and Isabella Oliver. Don’t see it listed? We’re constantly updating this section, but you can always search for other cute brands like Rosie Pope, Olian Maternity and Seraphine. Rethink size. While the “My Size” filter is great for shopping, sometimes it’s helpful to turn that feature off to be able to search outside your size and have more options to choose from. Plus, as moms who know will tell you, you don’t always have to size up just because you’re feeling large. Basics and accessories are your friends. These are the secrets to good maternity style and often can be found outside of the maternity category. Look at styles you currently love and see which items will be your best investment. Chances are you’ll wear jeans, tees and an LBD, and then you can mix it up with jackets, scarves, bags, shoes and jewelry. Prep your listings in advance. Free time is limited after the baby arrives, especially if he or she isn’t your first bundle of joy. By taking cute, styled and/or modeled photos in advance and saving them to your device, listing the items while multitasking will be a breeze. Create a searchable listing description. Knowing our above tips for searching, keep this in mind when it’s time to create a listing. Thoughtful listing titles, descriptions and sizes will ensure that your items will be discovered. Spread the word to other moms and moms-to-be. Have great deals? Find something you love? Don’t keep it a secret! 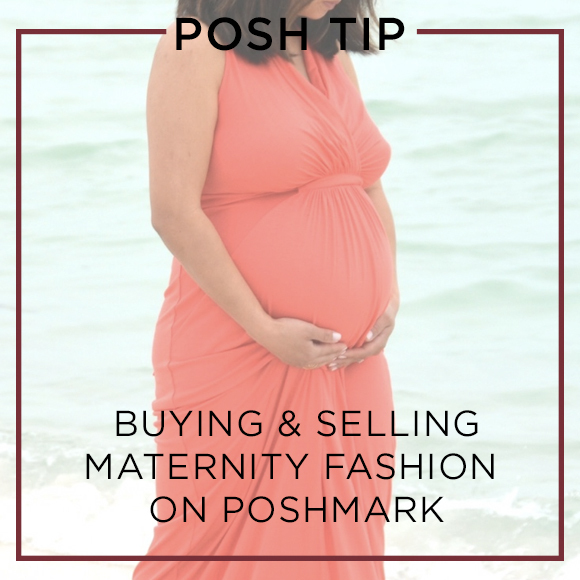 Help each other out and spread the word about buying and selling maternity fashion on Poshmark. Utilize the sharing features to post your closet and individual listings via Instagram, Facebook, Twitter, Pinterest and more!